The following insights should be used as a resource for Chief Financial Officers (CFOs) as they lead or support their organisation through a cloud adoption journey. It is designed to provide an overview of cloud adoption drivers, costs, risks, and benefits, as well as raise important questions about staffing and technology decisions that are critical to success. It is also intended to help inform business cases, while surfacing measurements and indicators specific to cloud environments that impact the bottom line. 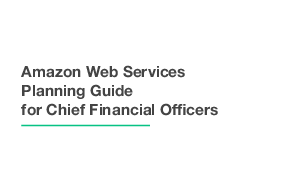 The foundational guidance provided is a collection of insights captured and distilled from direct conversations and engagements between Amazon Web Services (AWS) and customer CFOs representing an extensive range of industries.